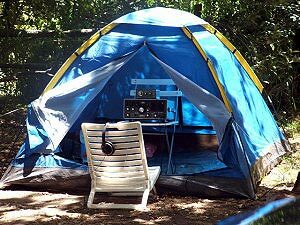 My QTH in Fish Hoek is situated in a favourable location for AM dxing, 1km from the False Bay coast to the east and about 9 km from the Atlantic side to the west. However the local neighbourhood electrical noise has increased quite substantially during recent years, to the point where dxing all but the strongest stations has been virtually impossible. 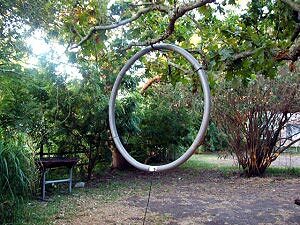 Fortunately, a recent purchase of an ALA1530 loop antenna has improved the reception from home quite dramatically! 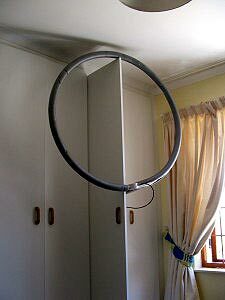 The ALA1530 suspended form the cupboard door at home in Fish Hoek. 5) I can dx from home again! I seem to experience some signal attenuation from the North due to the mountain range in front of us, an obvious advantage so far as interference from the Africans and high power Europeans are concerned. By additional good fortune I receive Canada/USA through a gap/lower part of the range towards the North West (over the dip of Ou Kaapse Weg) and Australia/Far East is in the clear on the opposite South East side. 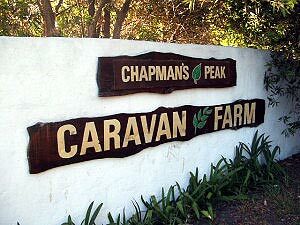 Chapmans Peak Caravan Farm Entrance - 2km from the Atlantic. 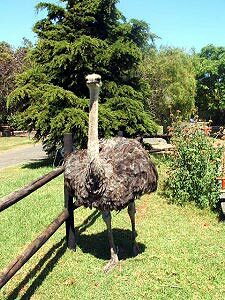 I concentrated on reception from North America which has not been heard that frequently here in South Africa during recent years. However, encouraging openings from that part of the world were noted during December 2005 and January 2006. 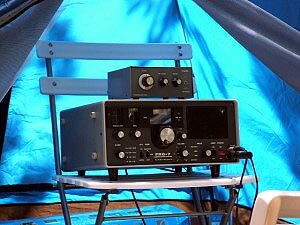 Stations from the USA would usually appear from around 0100 UTC. However, the period from a half hour before to a half hour after local sunrise (approximately 0300 UTC to 0400 UTC) provided the best results. 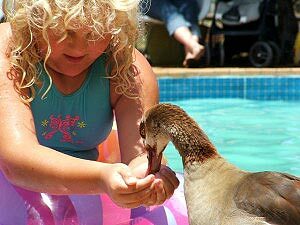 During the first half of January, I took the family on a camping holiday to Chapmans Peak Caravan Farm, Noordhoek. Although only a few kilometres from home, the location is really scenic and quite different from Fish Hoek. One might as well have been 1000 kilometres away! 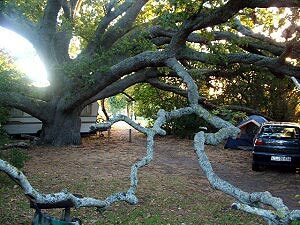 The camp site is situated approximately 2 km from the Atlantic. The reception from North America is similar to what I experience at home except for the fact that local electrical noise levels are less noticeable. The 2km distance from the Atlantic also provides a slight advantage. The receiver, as usual, was the ultra quiet FRG7 with the ALA 1530 looop antenna. The following stations were received during an intense series of dx listening sessions from Fish Hoek (24th December 2005 to January 5th 2006) and Noordhoek (January 6th to January 15th 2006). 800 0319 CKLW Windsor ON w id and px promo "Waking you up week day mornings 5 to 9, It's 'The Morning Drive' on AM 800 CKLW" followed by wx forecast - fair peak Pleased about the appearance of this station which had to compete with Brazil and TWR Bonaire. (A distance of 8 288 miles/13 337 km). 1190 0203 WLIB New York NY w ad for Accu weather.com and id as : "Air America Radio Traffic and Weather on 11-90 WLIB" followed by New York traffic report - good peak - 9/1 Most consistent signal of the USA stations heard here with surprising peaks. 1360 0325 WKAT Miami FL w highlights from the Dennis Prager show, also SRI news at 0353 and id as "News-Talk WKAT" at 0359 UTC - fair (personal first). It was great to experience some good openings from North America, including a few of the old favourites from the 70's and 80's. There were at least four or five mornings with NA stations across the band which reminded me of the "kid in a candy store" experience as decribed by our dx friends in Australia! It's quite comforting to hear that some of the US stations like 1010 WINS and 1170 WWVA have still managed to retain their identity and format after all these years. It's also interesting to note the inclusion of Old Time Radio programs on 900 CHML, and the oldies format on 1520 WWKB, a pleasant change from a dxer's point of view, from the large sport and news-talk networks which seem to be incorporating more stations into their respective formats.